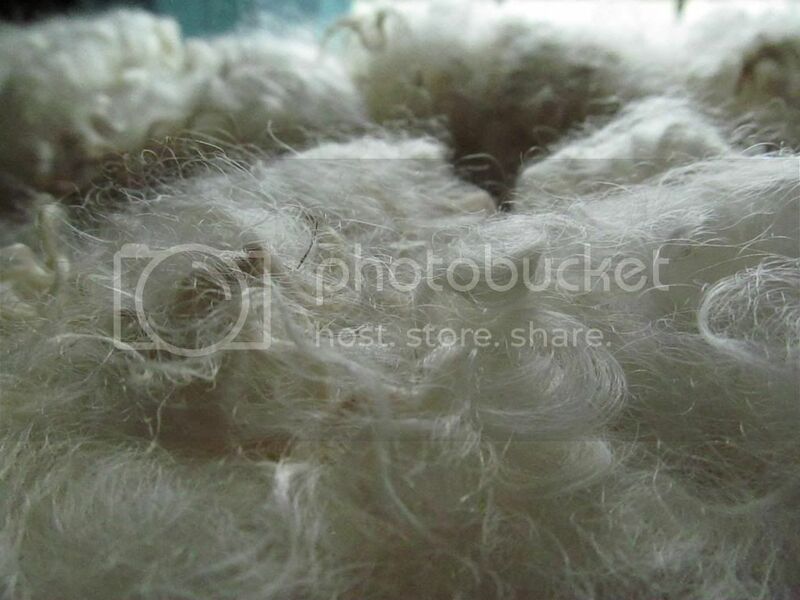 Wool and Wheel: Adventures in washing raw fleece. 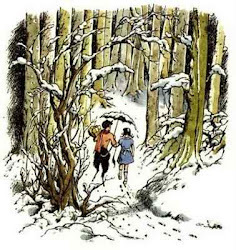 Be warned...this is a long, rambling post. The other box contained 7 pounds of gorgeous curly raw fleece from a Leicester Longwool sheep who lives on a farm several hours away. You might remember that back in October, I was suddenly hit with a fascination of spinning. I really enjoy spinning with my spindle. It still amazes me that you can take a bit of fluff, twist it, and make yarn. My latest obsession is taking that a step further...I wanted to try the whole process: buying a fleece, carding it, spinning it, and knitting with the finished yarn. I decided to start out with the one pound of Corriedale fleece, figuring that it would be better to start small than dive into my big fleece, and that if I messed something up it would hurt less this way. :) The book Start Spinning has a section about the basics of starting with a fleece, and I would have been okay using her instructions for washing fleece. But no, I had to go look on Ravelry. 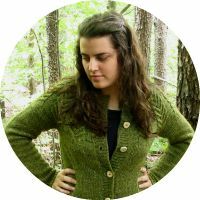 If you're a knitter or spinner or involved with fiber arts in any way and aren't on Ravelry, you are missing out! Signing up on there is the best thing I did when I first started knitting. The forums are full of incredible knowledge, but they cause you to overthink everything. So then I was not only worried about the actual washing, but what kind of Dawn detergent to use and what temperature the water should be and how long to let the wool soak. I dumped the one pound fleece out onto a sheet and spread it out. They can fit more in that little bag than you would think! Even after all of my research, I wasn't too sure about what I was looking at. I could separate it into lock sections in a few spots (see next photo), but generally it just looked like a pile of fluff. Not only was it dirty, but it stunk. We live on a farm, and I know what farm animals smell like. But this thing was very sheepy smelling. I haven't been around rams too often, but I know what a male goat smells like, and this reminded me of it (though not quite as bad :). Okay, moving on. I filled up a large plastic tote thing with very hot water, and then set up a plastic storage tote so I could swap back and forth quickly. 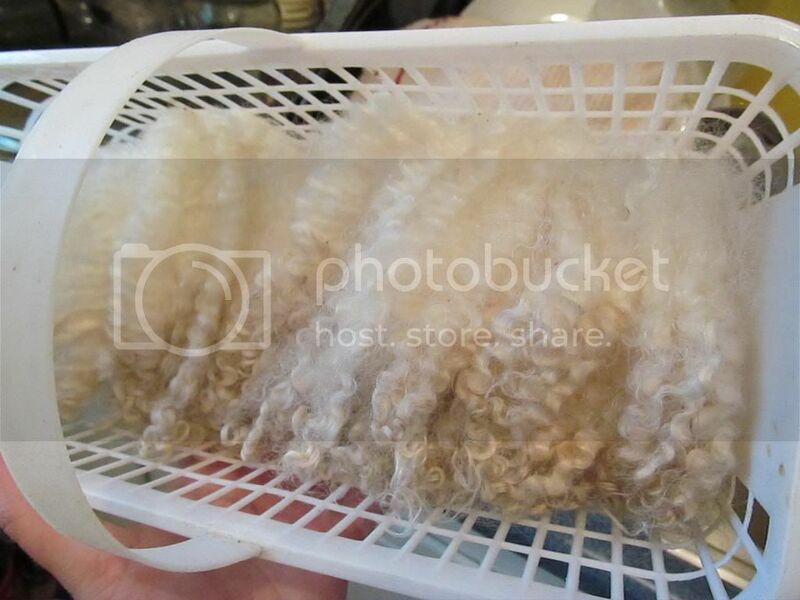 Here's the routine: soak the fleece 15 minutes in hot water with lots of Dawn dish detergent (the classic blue formula...apparently the fancy new ones have enzymes that can destroy protein fibers, and wool is a protein fiber). Soak the fleece another 15 minutes in hot water with less detergent. Soak the fleece 5-10 minutes in hot water with some white vinegar (apparently it helps the smell and neutralizes some of the detergent stuff?). 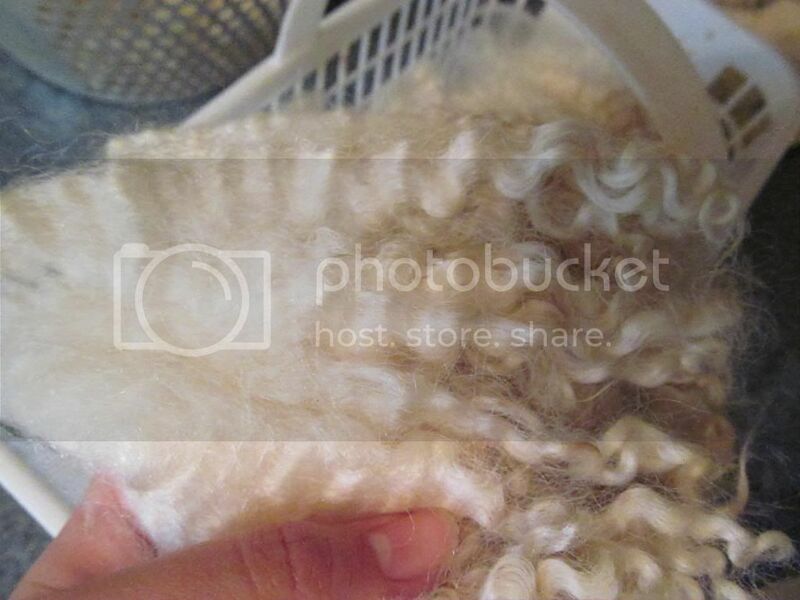 Soak the fleece one last time in hot water to get out the vinegar smell. Take it out and let it dry in a well ventilated area. Here's the problem...I didn't think this out well enough. I knew exactly what to do but didn't think out how to do it. Our water is not that hot, and I wasn't about to go adjusting the hot water heater. So I had to heat large pots of water on the stove to get it hot enough (it has to be at least 140 degrees to melt the lanolin, apparently). And the water pressure in our kitchen sink is really low so I had to fill up the pots in the bathtub, tote them to the kitchen, then heat them up on the stove. That was tiring. 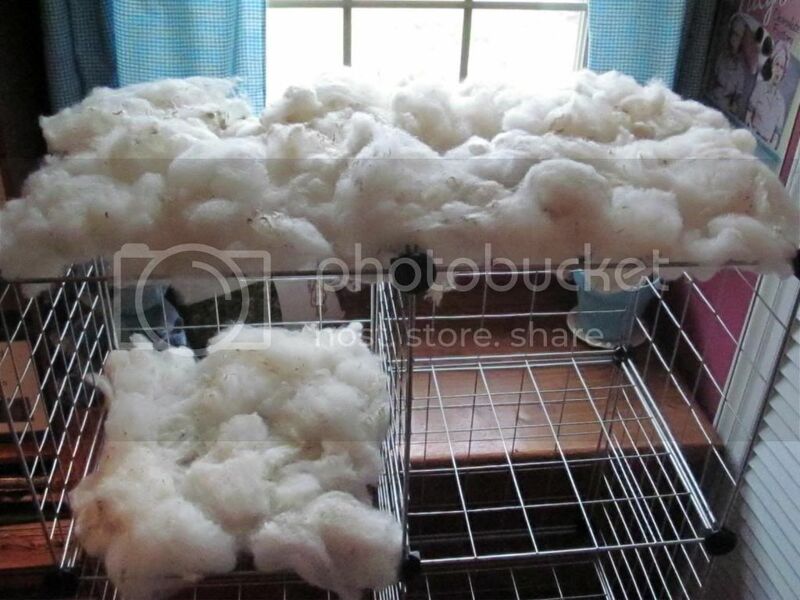 I put the fleece in the first soak, and things are going good. The water is getting filthy, which hopefully means the fleece is getting clean. I fill up the second plastic tote and the 15 minute timer goes off, and I get ready to move the fleece to the new water. But I also didn't think out how I was going to do that. Lots of people use mesh laundry bags...we didn't have any. Others put the fleece into a laundry basket and lower it into the water...our laundry basket was too big to fit down in this tote. So I guess I assumed I could lift it out gently with my hands. But guess what? The water is still basically boiling hot. You can't stick your hands in it, goober. At that point, I was panicky. I enlisted my mom's help, and with each of us armed with a metal spatula and a large slotted spoon, we attempted to lift the soggy fleece out and move it to the next pot. It was not easy. And I was convinced that I had ruined the fleece because we probably felted it while trying to fish it out. Three baths later, I took the cover off my ironing board and put layers of towels on top of it, and then spread the fleece out to dry. But by the next morning the towels were smelling damp, so I followed through with an idea I had the night before about 10:30 p.m. I used these metal wire storage cubes I have to make a drying rack (it works so much better! I would have put the fleece outside to dry but it's been cold and rainy). I still don't know if I ruined it. It doesn't really look felted, but it reminds me of stuffing. I don't know how it's supposed to look! It's very white, but it still has lots of vegetable matter. I'm going to try and card some of it later this evening, and I'm hoping most of the VM will fall out as I do that. After all of that, on Monday morning I was feeling pretty nervous about starting on my whole fleece. But I knew it needed to be done soon (apparently moths and bugs are very attracted to dirty fleeces when you store them). I dumped it all out on a sheet again...you can't tell how big it is in the photo, but was a huge pile! This fleece is so different. It has almost no vegetable matter. The ends of a lot of the locks are tan or brownish, but the cut ends are already white. And it doesn't smell sheepy at all. It has a distinctive smell (probably the lanolin), but it doesn't stink. It was so greasy, though! Just barely touching the locks gets grease all over your fingertips. 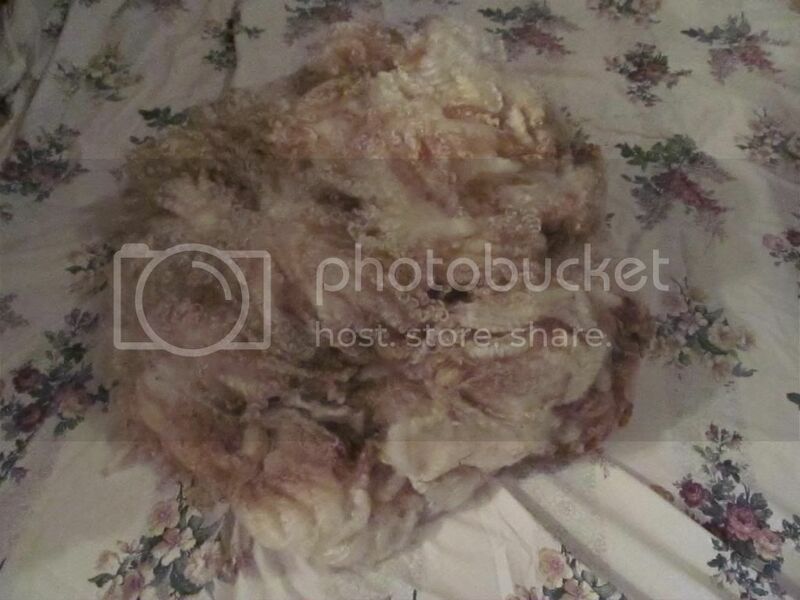 This fleece came from a Leicester Longwool, which is a rare breed considered critically endangered. (They were extinct in the US in the 30s and 40s, and even now they estimate there are less than 700 in the country.) The staple length for my fleece was 6 inches, though for this breed it can be much longer than that. After the very stressful previous washing, I had planned a little better this time. 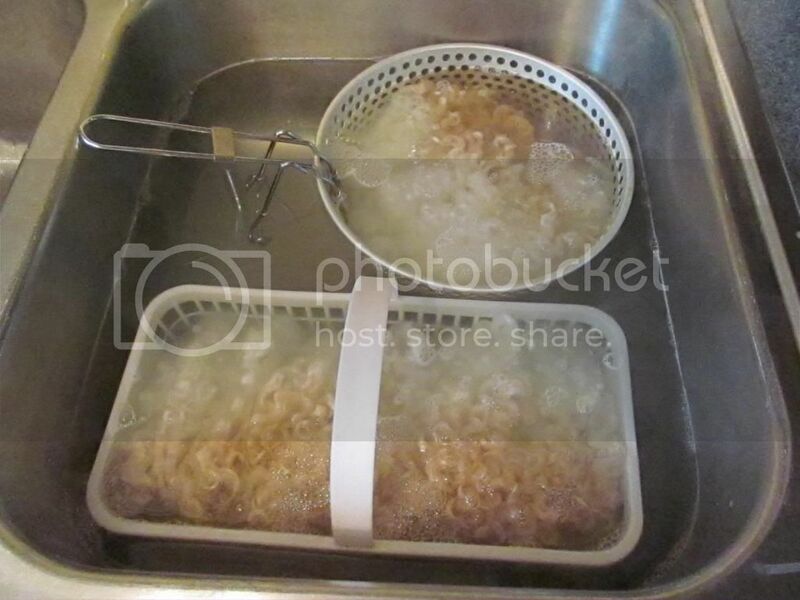 :) I decided to do very small amounts at a time, so I could do it in our kitchen sink (we have a double sink). I found this small plastic basket and a metal frying thing that could drain easily. With the basket, I could lay out the locks still in formation (I could actually separate them in this fleece). Look at how curly they are! So the second day was much more successful. It was still exhausting, though, with having to tote the water back and forth. And it's time consuming. 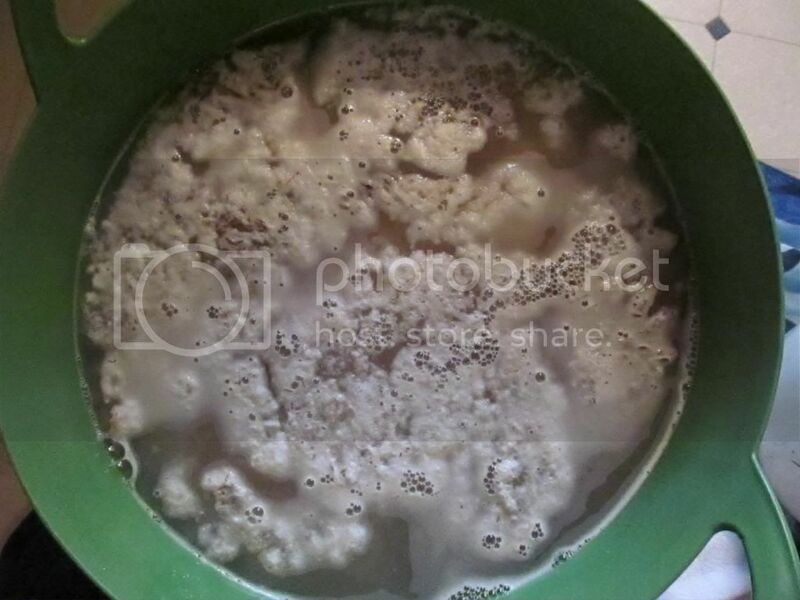 I washed four small batches on Monday, starting around 10:00 that morning and finishing about 2:00 or 3:00, and I was completely worn out. I might have gotten a fourth of the way done with the whole fleece, but maybe not even that far. If I can do at least that much each week, I'll be happy. 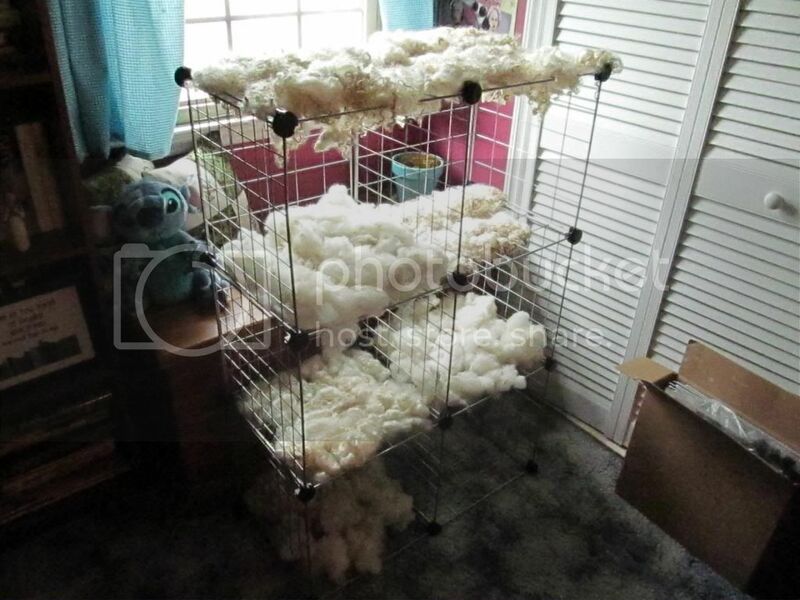 The wool is currently drying in my room. The first bit is probably completely dry. The Leicester Longwool is still damp, but it feels and smells clean. The tips are still a tiny bit greasy and discolored, but from what I read, that will all even out as I card or comb it. 1. It's not for the faint of heart. If the thought of your kitchen smelling like a wet sheep for a day bothers you, don't do it (or do it outside). 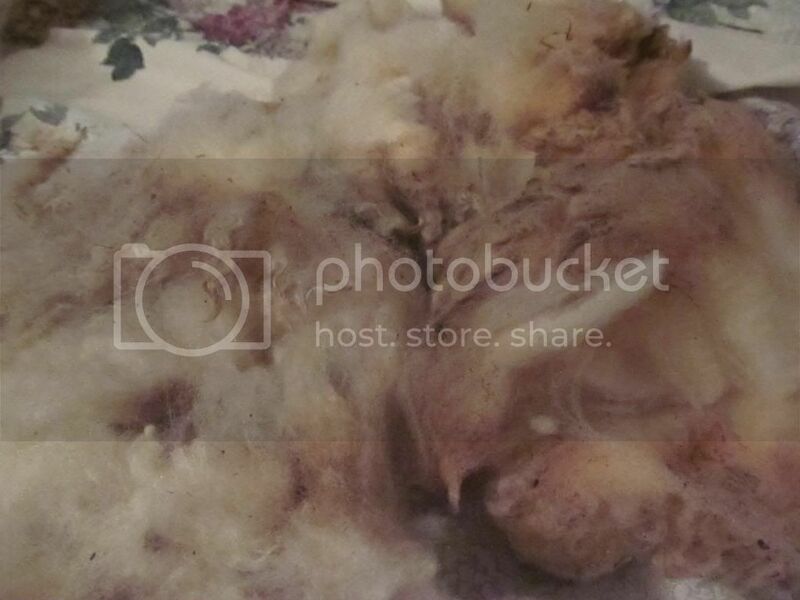 If the thought of messing with wool that looks like it came from the permed head of your grandmother (in the case of my fleece, that is) makes you queasy, don't do it. 2. It's much more time-consuming and exhausting than I expected. 3. No matter how much you've read and researched, you still don't know what it's really like until you try it yourself. 5. Your cat will want to help you. Ollie kept trying to chew on the fluffy raw fleece like it was cotton candy. P.S. I apologize for the dark pictures. Our kitchen doesn't have the best lighting anyway, and it's been a very dreary couple of days. My favorite way to wash wool is in the washing machine. I know, I know - the washing machine?! Seriously it is the easiest method and much less time consuming! So long as you don't let the machine agitate, it works perfectly. I've heard a lot about the washing machine method! I'll probably try it someday, but right now I'm awfully paranoid about the machine accidentally agitating. :) And since I'm probably going to comb the Leicester instead of carding it, I want to keep the lock formation as much as possible. I loved reading your post- thanks for the link! :) That's great that you have your own sheep. We have lots of hair sheep, which of course are great for meat but not for wool. :) I'm hoping to eventually have one or two wool sheep of my own.